Folding bicycles are a marvel of kinematic design. The ability of their inventors to see a wide variety of complex arrangements, shapes and sizes and later turn them into unique, elegant and simplistic machines is a remarkable feat of engineering design. However, the design challenge is rarely a bed of roses. 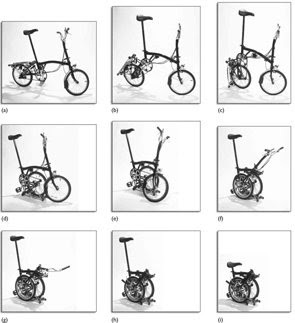 Perhaps one of the most widely talked about examples of lateral thinking in such a practice can be evidenced through the design process behind the Strida (see here). Today's interesting piece is one that must be read over a cup of tea or coffee since its a little lengthy. We'll look at the history, the design and innovation of what is widely regarded as the best folding bicycle ever made - the Brompton! We'll look at how the idea emerged, the kinematic design of the bike, and how prototyping and testing lend themselves to the feat of achieving a reliable final product. This old engineering article comes courtesy of UK's OpenLearn Learning Space so a big thank you to the design author, whoever he is. Go to buy any functional product, and you will almost certainly be presented with a range of different designs. Some of the differences will just be in the styling, but there may also be real differences in function or quality, which may be reflected in the price. Different design concepts lead to competing products with particular sets of advantages and disadvantages. Moving from concept to production depends critically on the industrial and social context. An idea for a new product, or a modification to an existing design, requires both human effort and financial input if it is to come to fruition. Part of the design process is the development of prototypes. A prototype is a ‘test’ version of the product, and may have different functions depending on when it is constructed during the design cycle. If the product is simply having a change to its styling, the prototype will be important in establishing the ‘look’ which will be attractive to consumers. If a new piece of technology is being used to improve a product, the job of the prototype may be more technical: to ensure that the product's performance is up to scratch. Prototype development may be one of the most costly and time-consuming stages of finalizing the design; it may involve extensive market research, or prolonged laboratory and consumer testing. If the design life cycle is shortened, to hasten the arrival of the new product in the marketplace, the risk of failure goes up. More designs for a product arriving faster on the shelves is good for consumers, who will revel in the choice, but not good for employers or employees who are staking money and jobs on success! As an example, James Dyson is on the record as saying that the design of his cyclone vacuum cleaner came about after the making of 5000 prototypes. The third case study I have chosen to continue the design story is an accessible example that allows me to look at some engineering specifics: it is the design and successful production of a folding bicycle. At the end of the study I shall consider the general lessons and issues that arise from the study. However, remember that most designs fall by the wayside, so its success makes it atypical. 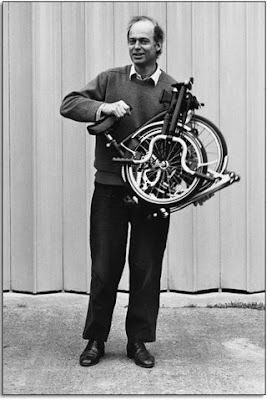 Andrew Ritchie started designing a folding bicycle in 1975, stimulated by the Bickerton folding bicycle design. The Bickerton is made from aluminum, and is hinged at the chainwheel bracket. (The chainwheel is the toothed wheel driven by the pedals.) This means that the chain and chainwheel are on the outside when the bicycle is folded, and the two wheels come together. "Aluminium is too soft for a folding bicycle, it just doesn't stand up to the knocks, the everyday wear and tear." The first criticism is easy to accept, but his view on aluminium is not at all obvious. After all, many bicycles are made from aluminium, which is a light, corrosion-resistant material, seemingly ideal for a portable bicycle. If it is good enough for top-of-the-range cars like the Aston Martin V12 Vanquish, why not for a bicycle also? Remember that its corrosion resistance and low weight made it a good choice for the Res-Q-Rail. I shall return to this issue later. In an existing firm, say a bicycle company, an idea for a new product such as this would include other people in critical roles. Perhaps market researchers, involving bicycle users, to estimate the size of the potential market and the interaction between designers with technical expertise in, say, production and structures. Cost would play a large part in the discussions, as would risk and the effect of the project on existing products and commitments. An independent designer can often find it difficult to get a sympathetic hearing when they take their ideas to established manufacturers. They face the ‘not invented here’ syndrome, which suggests that companies put their faith in their own in-house ideas but cannot see the potential in ideas from outside. Alternatively, they see potential legal and economic problems in protecting and investing in a design which may have been shown to competitors. This is a common enough story: the Dyson vacuum cleaner was hawked around established vacuum cleaner companies who rejected the idea. Andrew Ritchie was to experience the same rejection from bicycle manufacturers. His basic idea, which remained constant through the development of prototypes, was to hinge the bicycle to make the wheels come to the ‘center’, one on each side of the chainwheel. In this way the wheels would shroud the oily chain and chainwheel. Such a ‘kinematic’ solution (referring to the way that the parts of the bicycle move relative to each other) occupies a different design space from that of the Bickerton. It gives the same functional solution – reducing the length of the bike down to something which is more portable – but the way by which this is achieved is different. The concept of where the bicycle is hinged, and how its parts are arranged when folded is different. Once that concept is established a way of realizing it is required. By way of introduction to the Brompton story, the figure below shows a recent production Bromption being folded. The first stage is to swing the rear wheel underneath the frame – see pictures (a) to (d). As you can see, the wheel hinges in its own plane. The next stage is to move the front wheel to a position alongside the rear wheel; pictures (e) and (f). This is done by freeing a clamp on the frame crossbar, near where the crossbar joins the headstock. (The headstock is the part of the frame to which the handle-bar pillar and the front wheel are attached.) Once the clamp is freed, the front of the frame can be hinged sideways to bring the front wheel beside the rear wheel. This sideways movement of the front end is a significant feature of the production model. 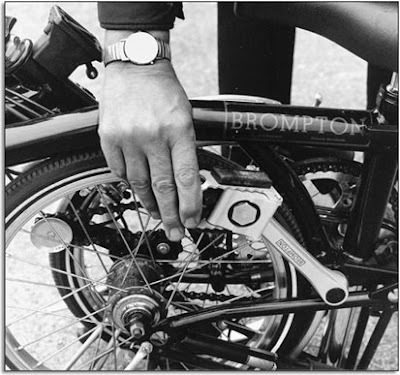 As we shall see, the first prototype Brompton used a different technique. 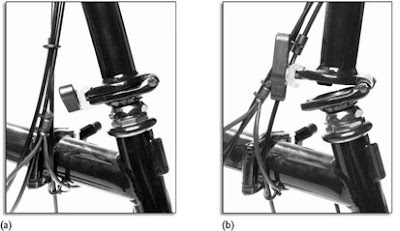 Another clamp, just above the headstock (figure below), is freed, allowing the handle-bar pillar to hinge down to sit alongside the front wheel; pictures (g) and (h). The final step is to unclamp the seat pillar and to slide the seat down; picture (i). This action locks the bicycle into its folded arrangement. In the figure above, the clamped crossbar hinge is visible behind the bundle of cables. This hinge, when unclamped, allows the front wheel to be moved to a position alongside the rear wheel. Bicycles designed to be folded into a convenient shape have a long and honorable history going back at least as far as 1885. The figure below is a collage of a few of the many solutions to the problem. 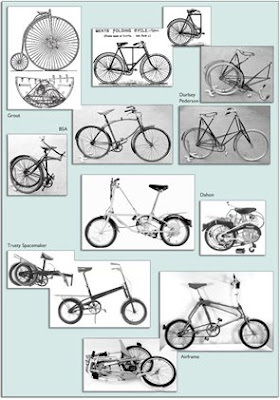 Common to all these designs (and the Bickerton) is the problem of the protruding chainwheel, so Ritchie's concept looks to be a genuine innovation. In Ritchie's first prototype design (P1) the rear wheel hinged forward in its own plane from the lowest point of its triangular support structure. However, unlike the production model, the front wheel of P1 also moved (almost) in its own plane underneath the bicycle to sit alongside its partner; in this case some sideways movement was needed to ensure that the front wheel sat next to the rear one, rather than just bumping against it as it hinged. To achieve this the front wheel needed a complex, skewed hinge to move it the few inches sideways so as to clear the rear wheel and chainwheel. As well as moving the two wheels to the centre, it was necessary to move the saddle, together with its pillar, and the handlebars into the same space. The seat pillar telescoped to get the saddle into the packing space, which had the advantage that saddle height adjustment and packing were accomplished by the same mechanism. The telescoped seat pillar slid down behind the hinged rear wheel, so locking it in place, an important feature that has survived the transition from prototype to production. Ritchie was driven by a search for ‘the ultimate in compactness’ when designing and building P1, which was a platform for various design ideas. Prototype P1 used 18 inch wheels, then common on children's bicycles. The main tube of the frame was lower than in the production model and the bicycle was not stiff enough (see Stiffness and flexing). Bowden cables linked the front- and rear-wheel folding mechanisms. Ritchie uses the expression ‘good luck rather than design’ to describe unpredicted advantages of his conceptual design solution. The major design difference between P1 and subsequent prototypes was the removal of the complex skewed hinge required to move the front wheel in its own plane underneath the bicycle to sit alongside the rear wheel. The front wheel now hinged orthogonal to the plane of the bicycle (i.e. it moved sideways from the line of the frame, as happens in the production model in Figure 46 (e) and (f)) using a purpose-designed hinge made from tubing. The rear wheel continued to be folded underneath the frame. The P2 saw the introduction of castors on the rear luggage rack, on which the bicycle sat when the rear wheel was folded underneath. These too have survived. Unlike the production model, P2's handlebars hinged down, one each side of the package. Also unlike the production model, the seat pillar of P2 consisted of more than one tube which telescoped during folding. Two more prototypes were built using sliding tubes to produce hinges, this time with 16-inch wheels. Wheel size is a key issue for the designer of a folding bike. Smaller wheels are easier to pack small, but the smaller the wheel the bigger the pothole feels! There is also the ‘make or buy’ decision to consider. Mass production of bicycle wheels is a big issue; it is much easier for a manufacturer to buy-in wheels produced by a large manufacturer than to dedicate machinery and labour to the production of wheels just for their own product. Andrew Ritchie's intention was to sell the design. To further this ambition, he applied for and obtained a patent in 1981. You will read more about patents in the next unit, but for now it is worth noting that his patent may have been difficult to defend, owing to the number of previous designs of folding bicycle that were available. He certainly could not have afforded to defend it if his design had been copied by a large manufacturer, but nonetheless it is a formal statement of the design, a design representation, and a claim to intellectual property. In total Ritchie built four prototype machines, with a low main tube, between 1975 and 1979, to prove and develop his ideas. His next problem was to turn the design into a product that you or I could buy. Because Andrew Ritchie could not sell his idea, he decided to set up his own factory to manufacture the bicycles. He borrowed money from friends (the interest on the loans was a bicycle) to build 30 bicycles and 20 for sale. The main tube was positioned higher and a simpler bought-in offset hinge replaced the purpose-built tube hinges. This forged hinge, which was critical to the Brompton's development, was from France. So, detailed design changes were made to the hingeing system with some benefits to compactness resulting from positioning the hinge higher in the frame. The telescoping seat pillar was dropped, becoming a single tube, and the frame was braced with a small diagonal cross-beam to give it extra stiffness. "After the first 50 I got a small-firm government loan to produce batches of 50 bicycles; 400 in a year and a half." Designing and manufacturing low-cost tooling was a harder job for Ritchie than designing the bicycle. There are many design routes to producing a lighter frame or a more easily manufactured frame that are not available to a small batch manufacturer. He had to use soft, mild steel for the main tube as he could not bend stronger alloy steel, and the main tube had an aesthetically ugly kink from the bending process. Plastic parts were machined from the solid and metal plate was drilled, cut and bent. The process is essentially scaled-up craft production. During this period Ritchie learned from customers, and from riding his own bicycle. Indeed, sometimes detailed redesign was necessary in the light of problems and failures brought to his attention by users. The business remained vulnerable, although there was helpful press exposure (See KEW FOR A RIDE below). In 1981 the French manufacturer of forged hinges discontinued production so Ritchie stopped batch production and wrote a Business Plan. After a hiatus of five years, in 1986, Ritchie eventually raised £90,000, half of the money he needed to go into mass production, from a customer, friends and family, and went ahead anyway. The drive to design for manufacturability continues apace. A tool was designed to curve the main tube, so removing that kink. At the time of writing, 2000, a power press allows the use of a higher specification of steel for the main frame member. The hinges were machined from the solid until expensive forging tools could be bought in 1987. Ritchie is working on removing the skill from the manufacture of hinges. From The Standard, Wednesday 3 February 1982, p. 19. At 8.00 a.m. today, as always, Andrew Ritchie arrived at work on his bike. Mr Ritchie works at Kew. He has a workshop there and he built the bike he arrived on in the workshop. A most remarkable bike it is too. It takes a few seconds to fold it up into a neat package less than 2 ft square which you can pick up and carry anywhere. No other collapsible bike in the world, says Ritchie, collapses so totally and so easily. And it is just as simple to un-collapse it into a bike again. Ritchie, an old Harrovian who read engineering at Cambridge, is 35 and says he is appalled by the amount of his life he has already given to this bike. He had the idea at the beginning of 1976, but it wasn't until early last year that he was able to move into the workshop at Kew and put the bike into production. He had orders for 30 bikes, mostly from friends and friends of friends. These were made and delivered by last March and, to his great relief, they brought in orders for 20 more. By the time these were made another 30 orders had come in and there was some welcome help from HMG in the shape of a Small Firms Loan Guarantee. So this particular small firm stays bravely afloat in these choppy seas, an example to us all. It currently has a workforce of two – Patrick Mulligan, brazier and Andrew Ritchie, managing director and assembler – and this will increase as orders come in. Meanwhile there are 56 Bromptons – that is what the bike is called – on the road now and 24 more ready for delivery and I can report that Judge Abdela has been seen arriving at the Old Bailey on one, that Lord Fraser of Tulley-Belton, the Scottish Law Lord, rides one, and that Ritchie's bike, No 7 from the production line, got him from South Kensington to Kew and back all through the blizzards. It is, of course, an expensive way of making a bike, this, and each one costs £195 by the time you have added VAT. But they are extremely slick little bikes, and with only 80 made so far, think of the rarity value. A special pedal is used on one side of the bicycle. The pedal folds away, so that it does not project from the folded bicycle. This adds £33 to the current (2001) price list. The pedal on the other side does not fold, and nestles in a tangle of spokes and tubes when the bicycle is folded. The craft route to producing the pedal involves 64 operations. The company bought a piercing and blanking tool for £3500 in 1991 to reduce these operations. All the earlier prototypes and the first batch had a folding crank. "It was a clever eccentric mechanism that wore easily." It takes 21 minutes to braze the rear frame. The company is investing in an automatic brazing system for the main frame. "We spend 25 minutes inspecting the bicycle after production and listen to our customer's problems carefully. We have a fatigue rig and keep a constant watch on the details of supplied items. In the early days I sent a £3000 order back to a supplier who did not use a radiused milling cutter." Ritchie cycles regularly, so still tests ideas and changes. During summer 2000 Ritchie was assessing low rolling resistance tyres. "Gearing was always a problem. To most manufacturers the folding bike is a bottom-of-the-range product. We wanted proper gearing using a bigger-than-average chainwheel, so at various times we became involved in making gears, for example a 13 tooth rear gear. And we had problems with broken teeth. Things are better now. We use the 3 and 5 speed Sturmey Archer hub for gears. We have resisted the complication of Derailleur gears. All that extra complication is against the philosophy of the design. Perhaps we could sell another thousand bicycles. It's what the market wants. It's a luxury, but we do not respond." You can buy a Brompton bicycle, named after The Brompton Oratory, for about £500. Andrew Ritchie won a Queen's award for export achievement in 1995. Not at all bad for a company that, literally, started under the railway arches. Yeah,one best advantage you can bring them anywhere in handy manner.Fold it and put on the back of your car.That's what i do when we go for a vacation. This is really nice. It is so much comfortable that you're bicycle can be folded. A refoldable bicycle, i think its very convenient to use and it can also be brought in all places because of its wonderful features. This is so innovative, our future seems to be so great!